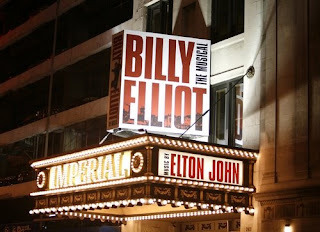 Most of the Stagenotes team (+ Tom) trooped to the Imperial Theatre last Saturday to catch Billy Elliot the Musical, which started previews 01 October. It is based on the popular film about a boy who discovers his love for ballet during the UK coal miners' strike in 1984. Our Billy was the multi-talented Kiril Kulish (two other boys, David Alvarez and Trent Kowalik, play Billy) His friend Michael was played by the scene-stealing Frank Dolce. London cast hold-over Haydn Gwynne is Mrs. Wilkinson, the ballet teacher who encourages the aspiring dancer to follow his heart despite his macho family's objections. Carole Shelley as his wacky grandmother gets to sing this fun song. For the first time in my theatre-going history, the show was stopped a couple of times during the first act due to problems with the set. It is very intricate and complicated, and of course, computer-controlled. Most people were understanding but there were a few "boos", grumblings and walk-outs. This is live theatre, people...deal with it. Plus for the safety of the performers, they had no choice but to stop and fix it. I felt worse for the cast, having to stop and start all over again. Director Stephen Daldry spoke during intermission to explain the problems, and offered us all free tickets to see the show again. The second act went off without a hitch. Suffice it to say, technical malfunctions didn't take away from my enjoyment of the show. The plot is timely and relevant: a community in flux, a boy in need of self-expression, a family in mourning. The music and lyrics are very moving, the dance sequences spectacular (the ballet juxtaposed with the clash between striking miners and the police was jarring yet poetic). But the biggest thrill was seeing these amazing kids onstage, especially Kiril. The show was...how should I put it? ELECTRIC. And I'm free I'm free"